When I paid a visit to Paris, France sometime ago, I noticed the Parisienne girls had barely any makeup on during the day. They walked about with their flawless porcelain skin whilst holding what looked like spring water sealed in a bottle. Their hair was something Rapunzel would be proud of; it wasn't voluminous or long but short and well maintained. The girls there know how to take care of their skin and don't really have complex routines when it comes to beauty. Whilst browsing a well known skincare brand, I spoke to one of the attendants and the conversation careened into beauty routine; she told me that glam for the French girls meant a bit of mascara, perhaps "some color on the cheeks and lips". France is a country that is credible when it comes to the beauty industry. The French churn out innovations in beauty that pretty much make most girls (including myself) want to buy it in an instant. I started using a Parisienne skincare brand a couple of years ago and have never looked back. The products are A+, deliver on everything they claim and while the price is on the higher end, it is worth every penny. Even the brand's beauty segment is beyond brilliant. From there on, I tried a handful of other Parisienne brands and loved them. There's not one that has failed me. Hence, I blindly trust skin and beauty care from France. So when another Parisienne brand popped on the my desk, I was excited to try them. Arcancil is a brand I'm familiar with and have reviewed previously. What I was excited about was to try the two new product launches. 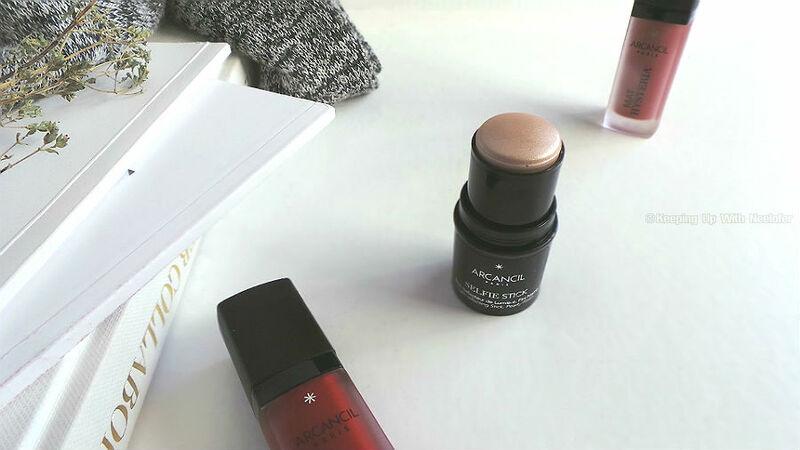 Let's start with something almost every girl has in her beauty arsenal- the highlighter. This is one of the best beauty inventions ever! Arcancil knows a girl's phone has more selfies than anything else, so they developed an iridescent highlighter known as the Selfie Stick. Doesn't that make you smile? The packaging makes it easy to pop off the lid and twist it to reveal the glorious stick. The shade featured here is the 001 Light and has a beautiful pearly finish. It conveniently fits in the palm due to its size and is easy to apply. 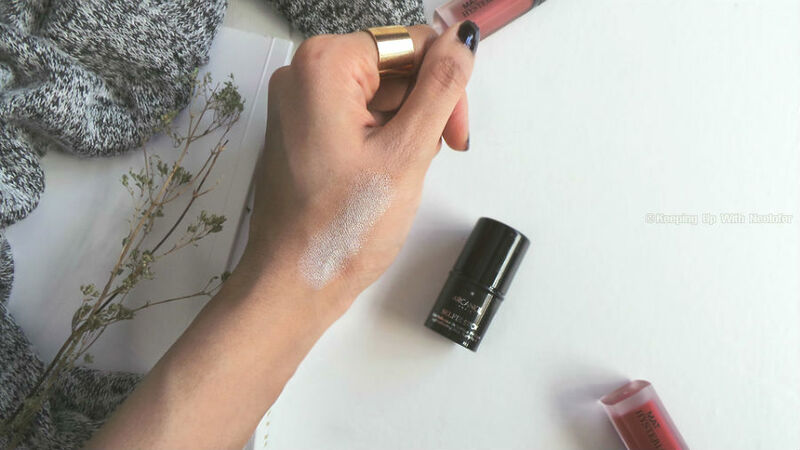 The creamy highlighter glides effortlessly onto the skin and a little blending seals the deal. You don't really require any touch ups throughout the day. I quite like this and have also used it on my eyelids (primer prior to application) for a little pop of iridescence. 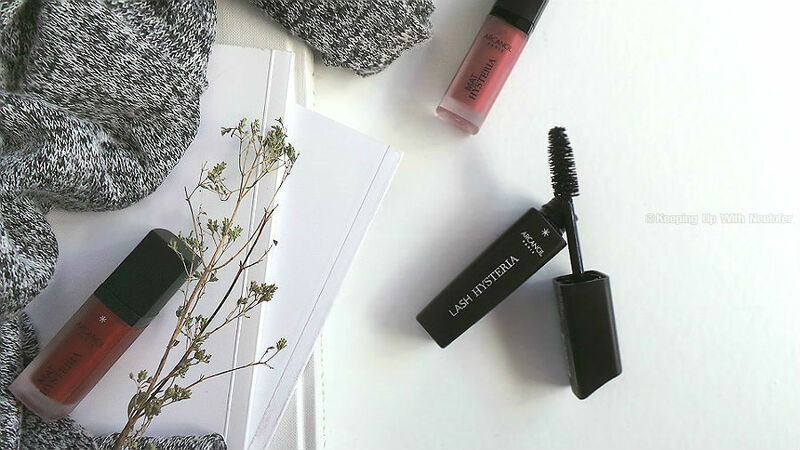 The Lash Hysteria Excessive Volume Mascara was made for the summer season. It's water resistant and comes in a sturdy black matte casing. I'm a strong believer in mascara brushes. You can have the best formula but if the brush isn't right, the formula is pretty much done for. This particular one by Arcancil has a thick bristle set and the tapered end of the brush manages to coat the elusive tiny lashes. The first coat lengthens the lashes and the second will add a bit of volume. This mascara will work best for individuals who are blessed with a thick natural fringe. Nonetheless, I loved the lengthening effect and did not experience any fall-out throughout the day. I used an oil based makeup remover to free my lashes of the product as I feel waterproof makeup removers don't really perform to the T (on the lashes). Anyone who knows me is well aware of my love for matte lipsticks. 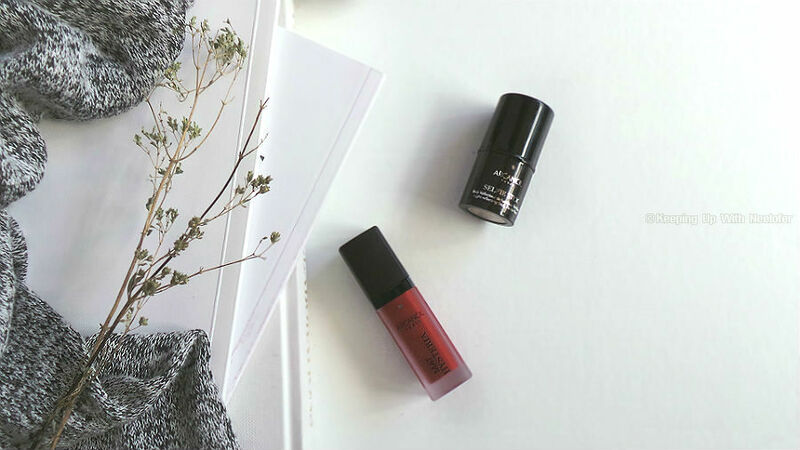 Be it liquid or bullet, matte lipsticks are my universe. About 80%-90% of my lipstick collection is matte and while I tend to gravitate towards the same dusty rose beige shade, I do own a handful of bold colors. 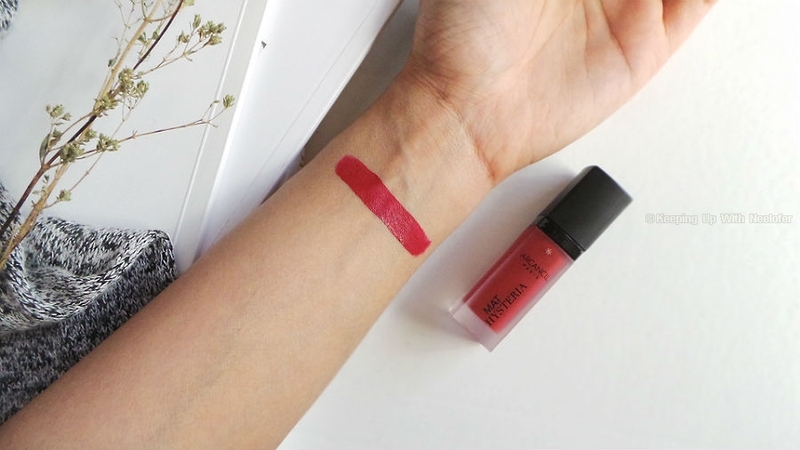 Arcancil's Mat Hysteria is one of their best liquid lipsticks range and having reviewed a set previously, I could tell this particular red would turn out to be as beautiful as its predecessors. 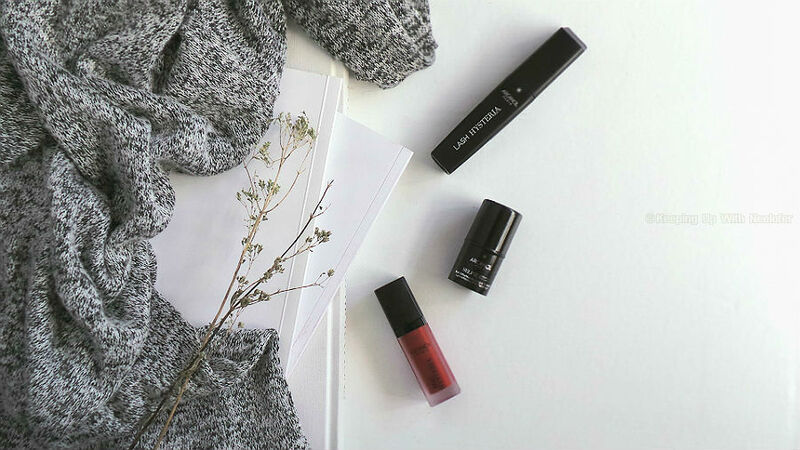 The liquid matte lipstick comes in a frosty matte casing with a doe foot applicator. The texture is quite smooth and glides on effortlessly. Featured here is the 125 Rouge Rock, a true crimson. It's such a beautiful evening shade that is incredibly opaque. One of the best things about it, is the fact that you really don't need to go through with a second swipe. Post the first application, the color dries down in a few seconds to reveal my preferred matte finish. I did not experience any dryness or flaking (I did apply a shea butter based lip balm prior to application) and neither did the color fade throughout the evening. The darker shades within the range withstand the food and drinks test and I didn't quite feel the need to touch up. My favorite from the lot is definitely the highlighter (and the lipstick). I love how none of these products failed to impress. Have you tried Arcancil previously? Let me know which one is your favorite and I'll give it a whirl!